Equity Analysis Guide (Online). The fields marked with a green triangle in the upper left corner can be edited to test different settings or assumptions for factors like sales growth forecast, net margin expectations and projected average P/E ratio. As shown here, the sales growth has been modified from 9.9% to 9.0% and the P/E forecast switched from 16x to 18×. Change a field or two and see the impact on the projected annual return. Keep in mind that this is a developing tool and may change in appearance. But as a proof-of-concept, we want to enable an audit capability where personal/group studies can be gauged versus the consensus-driven estimates used for dashboards. We’ll be exploring things like displaying complimentary graphics like sales growth history (and forecast) as well as profitability profiles and P/E ratio trends. Fields are populated by importing things like 12-month trailing sales results from public data and combined with the default conditions derived from our analysis of consensus estimates and trend analysis. One of the primary drivers is to enable side-by-side estimates of conducted studies vs. the Solomon database. Think of it as an audit, seeking differences and exploring them as them become obvious. We’ll be exploring and listening right along with you as we give thought to other implementations, etc. For now, explore and enjoy. Stock Study Library. As you conduct your studies, the results are retained. One of the drivers is to support a comparison with the analyst consensus-driven analysis. 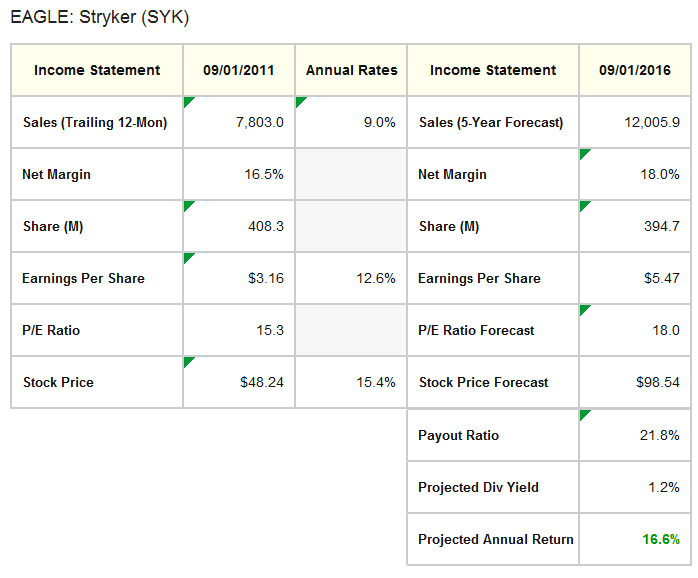 As shown here, the ACE-influenced results for Stryker are displayed on the first line for SYK. The result of different judgments for growth (9.0%) and P/E (18.0x) are shown in the side-byside comparison, with a “personally conditioned” PAR of 16.6% vs. the rhino-based result of 15.4%.